Skills and Abilities: Trained in unarmed combat while at Xavier’s school for the gifted. He also displays gymnastics abilities and is very agile. Powers: As a mutant he could produce a brilliant blinding light from his body. When his powers manifested his parents sent him and his sister to Xavier’s school for the gifted to learn how to control his powers. Once their they got addicted to the mutant power enhancing drug Kick and joined the Omega Gang who terrorized humans who were anti-mutant. 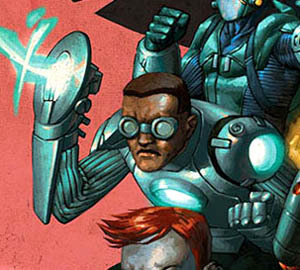 He was also responsible for the capture and submission of Prof-X before they were defeated by the teaching staff. He had his leg broken by Cyclops. He was sent to prison and after losing his powers he was recruited into a post civil war New Warriors along with his sister. Over the course of his adventures his sister was killed and he was severely traumatized. Soon after the team disbanded. It’s unknown what became of him.